I was drawn to this recipe in the Ball Canning Book because it seems like a quirky, retro dish that my grandma would have made. Also, I have gallons of apples waiting to be preserved from our tree so new recipes are always welcomed this time of year! If you’ve never tried them, they taste like a cinnamon-y sweet apple pickle. Sounds weird, but they’re good! Step 1: Wash, core and peel apples. Step 2: Cut apples lengthwise into eighths. Step 3: Treat with Fruit Fresh to prevent darkening. Step 4: Combine remaining ingredients in a large saucepot and bring slowly to a boil. Step 5: Drain apple wedges and add to syrup mixture; cover and simmer 4 minutes. Step 6: Pack hot apples into hot jars, leaving 1/2 in headspace. Step 7: Ladle hot syrup over apples, leaving 1/2 in. headspace. Step 8: Remove air bubbles. Adjust two-piece caps. Step 9: Process 15 minutes in a boiling-water canner. These apples would make a wonderful homemade gift! 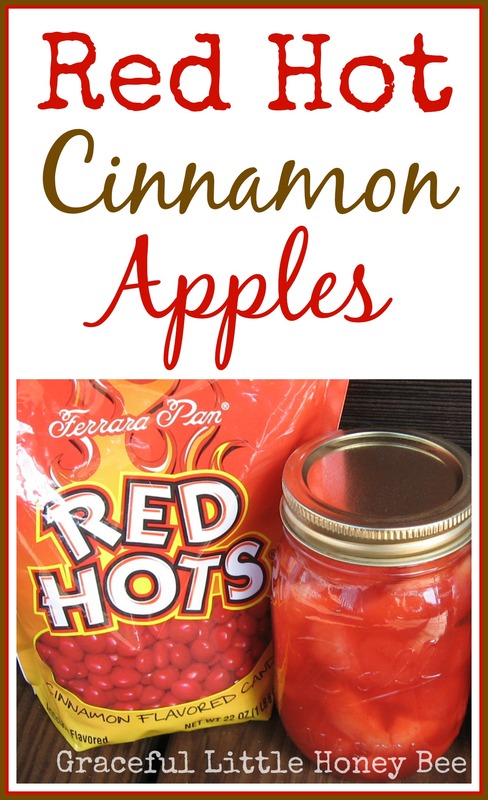 Have you ever heard of or tried Cinnamon Red Hot Apples before? I’d love to know! Wash, core and peel apples. Cut apples lengthwise into eighths. Treat with Fruit Fresh to prevent darkening. Combine remaining ingredients in a large saucepot and bring slowly to a boil. Drain apple wedges and add to syrup mixture; cover and simmer 4 minutes. Pack hot apples into hot jars, leaving 1/2 in headspace. Ladle hot syrup over apples, leaving 1/2 in. headspace. Remove air bubbles. Adjust two-piece caps. The vinegar kind of threw me too, but they turned out really good! I hope you will try them! They are really good! I hope you enjoy! A friend and I were talking about Christmas tradition foods our families made and these red hot cinnamon apples came up. So, I told her that I would look in the net to find some recipes. I came across yours and decided to go on your site, as I liked the comment about God and growing femininity. I love "the Lord and I am glad I used your recipe to give her. Missy, I am so happy to have stumbled onto your site. I am so impressed that you & others (not just me) are willing to exert some effort in order to eat well, healthy, & frugally. We live in a subdivision & have "raised beds" in the back yard & never have to buy tomatoes, cucumbers, green beans, peppers, squash, etc. We freeze many vegetables, can some especially mariner sauce, tomatoes, sauces, juice, etc. We use the bread machine & I bake from scratch & are happy to know that our food is without all those additives plus "it is clean!" We are already waiting for 1 January to get started back with our hobby; we do enjoy the Bill Best web site for seeds that are not genetically altered. Have fun everyone! My grandmother made these. We loved them. She didn't can them. She just made a smaller amount for a meal. They were always served with ham or pork chops. I'm so glad that you will enjoy them again! I have been making them for years but my recipe is a bit different than yours. Golden delicious apples, peeled and sliced. 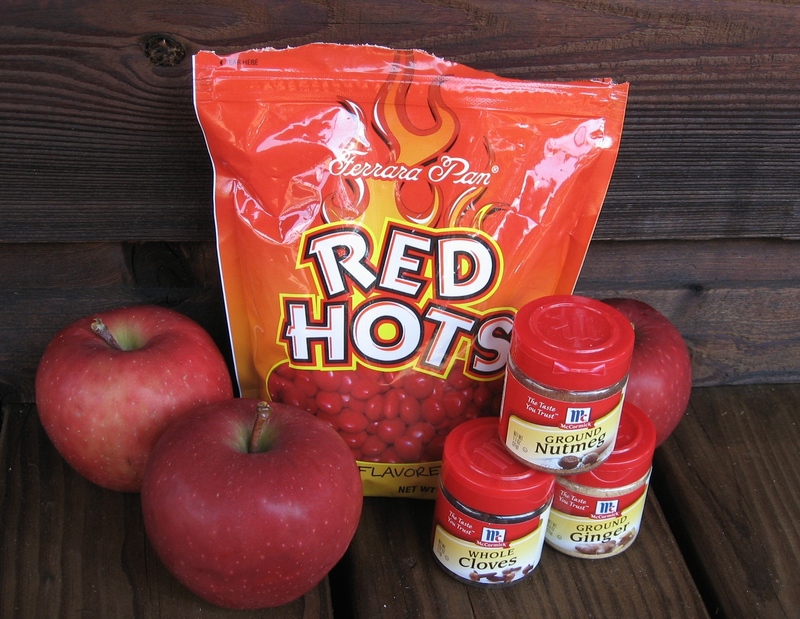 One or two handfuls of red hots in pan with about 2 cups water Medium heat, stir occasionally until apples are done. Before removing from heat add a cup or so of sugar or little less of Splenda Store in refrigerator. We love them so they do not last more than a day or two in our house! why the vinegar ? Would it be okay to leave it out ? 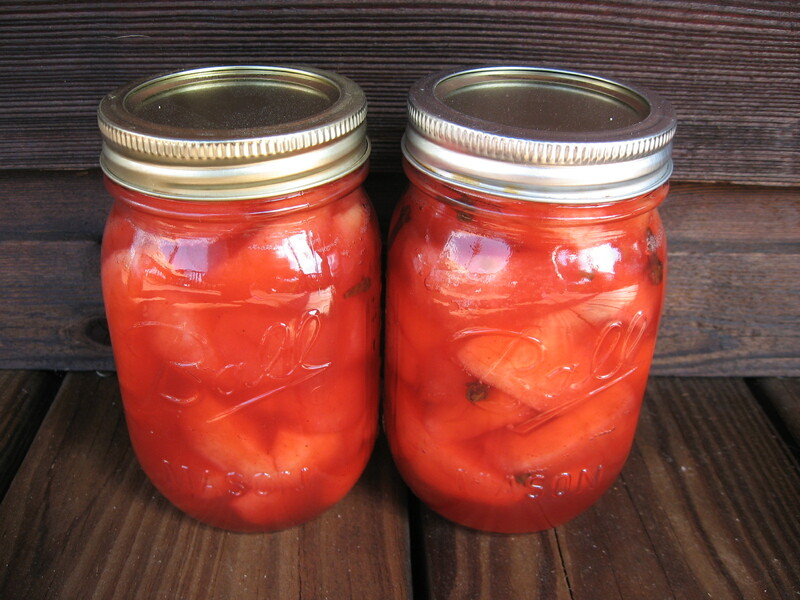 This is a tested recipe from Ball that is safe for canning. For safety purposes, you cannot alter this recipe if you plan on canning it. If however, you are just cooking it to eat fresh then you could leave the vinegar out if you wanted. my German granma made these as a side dish--- no vinegar, bu then she didn't can them.... quartered peeled apples, thrown in pan with hot water and melted red hots and sugar.................cooking til soft.... then refrig... never lasted long....I remember having thirteen at one sitting!! My dad made great red hot apples. He didn't use the spices, only red hots and I think sugar. Cooked as a side dish at dinner. Great memory. Yes, our family enjoyed them as part of ever holiday dinner, especially Thanksgiving and Christmas. My great grandmother considered them her signature dish. They were served in a beautiful cut glass dish that sparkled with the bright red apples inside. Our recipe is slightly different but the effect is the same. We continue this tradition. I grew up eating cinnamon apples. I've not seen your recipe before and will try it. I buy canned apple pie filling and dump in boxes of red hots and either cook in pot on stove or I put in crock pot. Both my family and coworkers love them. If I don't have whole of either cinnamon or clove, how much powdered would I use? Never knew any other way to make applesauce or stewed apples since that was the way my mom made it for the past 75+ years. Only difference is in the number of steps. I just peel and cut apples and place in pot with a tiny bit of water to just barely cover bottom of pot. Add a handful of red hots and cook on low. Cook longer for sauce or blend if you like it really smooth. Never tried fruit fresh as mine stays a yummy looking pink. Red hots are also great to add to rhubarb when making sauce. Cut rhubarb in half inch pieces and cook as for apples. Have not needed to add additional sweetener or spices as the red hots do a fantastic job on their own. We make these, I love them ☺ In fact, they used to serve them at Luby's buffet when I was a kid. I've never canned them, though.